9 Marlborough is located on the north side of Marlborough, between Arlington and Berkeley, with 7 Marlborough to the east and 11 Marlborough to the west. 9 Marlborough was designed by architect Charles K. Kirby and built in 1863, one of four contiguous houses (9-11-13-15 Marlborough). The four houses form two pairs of mirror opposite buildings (9-11 Marlborough and 13-15 Marlborough); each pair with a single entrance porch creating a symmetrical entryway. Click here for an index to the deeds for 9 Marlborough. When it was completed, 9 Marlborough became the home of Charles Allen Lambard and his wife, Abby (Williams) Lambard. They previously had lived at the Coolidge Hotel in Bowdoin Square. Charles Lambard was a merchant and investor in railroads, real estate, mining, and manufacturing companies. An early investor in the Union Pacific Railroad, he served as a vice president of the company. Charles Kirby mortgaged 9 Marlborough to Charles Lambard on October 15, 1863, and then sold the property to Ralph Cross Johnson of Belfast, Maine, on January 1, 1864. Ralph C. Johnson was the uncle of Charles Lambard’s deceased first wife, Frances Emily Johnson. The deed included a provision preventing material changes to the front façades of either 9 Marlborough or 11 Marlborough without the consent of the owners of both properties. The Lambards continued to live at 9 Marlborough in 1866, but moved thereafter to the Tremont House hotel. On November 15, 1866, 9 Marlborough was purchased from Ralph C. Johnson by Franklin Gordon Dexter. He and his wife, Susan Greene (Amory) Dexter, made it their home. Susan Dexter’s parents, Charles and Martha (Greene) Amory, lived with them. The Dexters previously had lived at 172 Beacon. They also maintained a home in Beverly. F. Gordon Dexter was a shipping merchant and another early investor in the Union Pacific Railroad. Charles Amory was treasurer of a textile mill. In 1872, the Dexters moved to 55 Beacon, which had been the home of historian William Hickling Prescott, F. Gordon Dexter’s maternal uncle, and his wife Susannah (Amory) Prescott, Susan (Amory) Dexter’s paternal aunt. Charles and Martha Amory moved to 198 Beacon. F. Gordon Dexter continued to own 9 Marlborough and lease it to others. By 1875, 9 Marlborough was the home of Mrs. Margaret E. (Harvey) Robbins, the widow of John F. Robbins, and their adult children, Edward A. Robbins, a bookkeeper, and Margaret E. Robbins, a sewing teacher at Adams School. They previously had lived at 106 Chestnut. They continued to live there in 1876, but had moved by 1877. During the 1876-1877 winter season, 9 Marlborough was the home of Dr. Henry Bradford Clarke, a homeopathic physician, and his wife, Martha (Mattie) Celestine (Little) Clarke. Their primary residence was in New Bedford. During the 1877-1878 winter season, it was the home of Mrs. Katherine (Kate) Smith (Prescott) Ward, the wife of Charles Chandler Ward, and their son, Prescott (Charles) Temple Ward. (Charles and Kate Prescott were separated; he died in January of 1879). They had lived at 71 Mt. Vernon in 1876. By 1880, they were living at 198 Beacon with her mother, Ruth Wetherbee (Brooks) Prescott, the widow of Otis Brigham Prescott. During the 1878-1879 winter season, 9 Marlborough was the home of William Whitwell Greenough, treasurer of the Boston Gas Light Company, and his wife, Catherine Scollay (Curtis) Greenough. They previously had lived at 34 Mt. Vernon. They also maintained a home in Quincy. By 1880, they had moved to 249 Berkeley. On January 6, 1879. 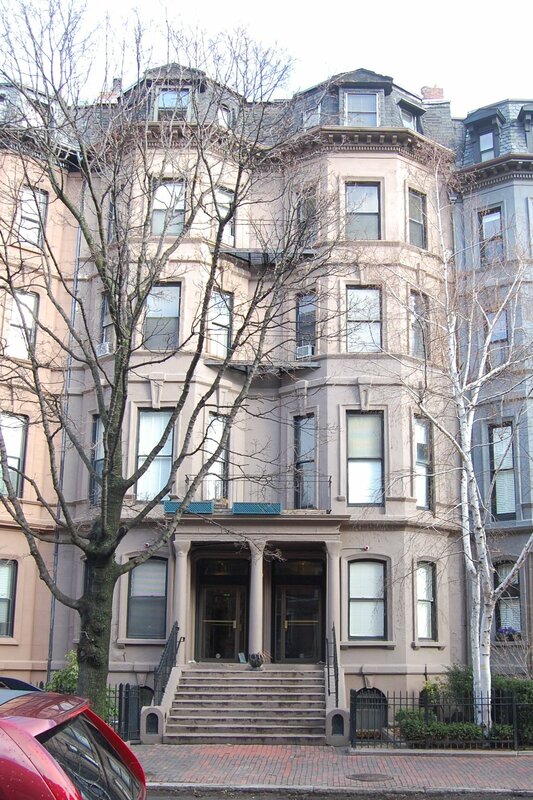 9 Marlborough was purchased from F. Gordon Dexter by attorney Edward Albert Kelly. He and his wife, Mary Adams (Farley) Kelly, made it their home. They previously had lived next door, at 11 Marlborough. They also maintained a home in Cohasset. Their daughter, Elizabeth Farley Kelly, lived with them. George F. Farley, Mary Kelly’s brother, lived with the Kellys until about 1885. He was a tea importer. By 1886, he had moved to the Hotel Victoria at 273 Dartmouth, and by 1887 to the Hotel Thorndike at 91 Boylston, where he died in February of 1887. Edward Kelly died in August of 1907, and Mary Kelly died in May of 1909. Elizabeth Farley Kelly continued to live at 9 Marlborough. In September of 1923, she married photographer and naturalist William Lyman Underwood, a widower. Their primary residence was in Belmont, but they kept 9 Marlborough as their Boston home. Lyman Underwood died in January of 1929. 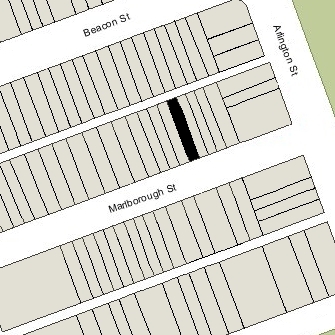 Elizabeth Underwood continued to live in Belmont and at 9 Marlborough in 1930. On April 9, 1931, 9 Marlborough was acquired from the estate of Edward Kelly by the Whitehead Realty Company (John Capobiano, president). In April of 1931, William W. Drummey, an architect with offices at 80 Boylston, applied for (and subsequently received) permission to remodel 9 Marlborough from a single-family dwelling into architects’ offices (two offices per floor). In its April 15, 1931, decision allowing him to use the building for this purpose, the Board of Appeal noted that the house “was formerly used as a residence but for the last two years it has been idle due to the inability of the owner to rent or sell same as a residence.” He ultimately abandoned the permit. 9 Marlborough was shown as vacant in the 1931-1933 City Directories and was not listed in the 1931-1933 Lists of Residents. On June 16, 1931, 9 Marlborough was acquired from the Whitehead Realty Corporation by Genevieve E. (Brett) McGlue, the wife of Charles Henry McGlue. They lived in Lynn. Charles McGlue was a lawyer and leader of the Massachusetts Democratic party. He served as Chairman of the State Democratic Committee for ten years in the 1920s and 1930s, and was a close associate of Boston Mayor (and Governor) James Michael Curley. He was noted for his expertise on election law. In later years, he adopted a number of ultra-conservative views and was a vocal opponent of fluoridation of the drinking water. On July 13, 1932, the Whitehead Realty Corporation foreclosed on its mortgage to Genevieve McGlue and took possession of the property. In about 1933, Charles and Genevieve McGlue moved to 9 Marlborough. Genevieve McGlue died in December of 1935. On January 6, 1936, Charles McGlue acquired the property from the Whitehead Realty Corporation. By 1936, Charles McGlue had been joined at 9 Marlborough by his mother, Lucy E. (Purdon) McGlue, the widow of Patrick McGlue, and his unmarried brother, Joseph Francis McGlue, a salesman. They previously had lived at 119 Sutherland Road. On April 21, 1937, 9 Marlborough was acquired from Charles McGlue by Mildred M. Manning of Wellesley. Charles McGlue, his mother, and his brother continued to live at 9 Marlborough. Lucy McGlue died in April of 1941. 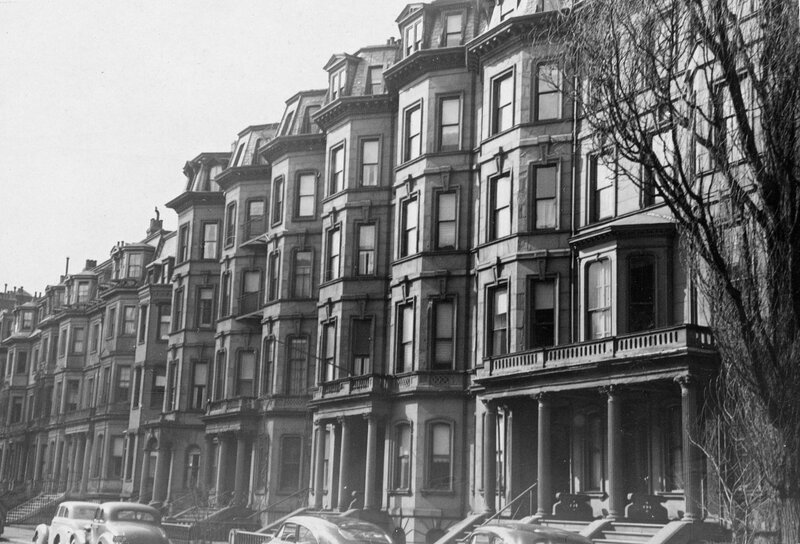 When the Whitehead Realty Corporation acquired 9 Marlborough in 1931, it had entered into a mortgage with the New England Trust Company, That mortgage was still outstanding and on October 16, 1940, New England Trust assigned it mortgage to John Capobianco, who had been president of Whitehead Realty in 1931 and later became a general contractor. On April 14, 1941, he foreclosed on the mortgage and took possession of the property. Charles and Joseph McGlue continued to live at 9 Marlborough, and on August 15, 1944, Joseph McGlue acquired the property from John Capobianco. On May 1, 1945, he transferred it back to his brother, Charles. Joseph McGlue married in 1945 to Mrs. Grace (Barber) Curtis. After their marriage, they lived at 9 Marlborough until about 1952. 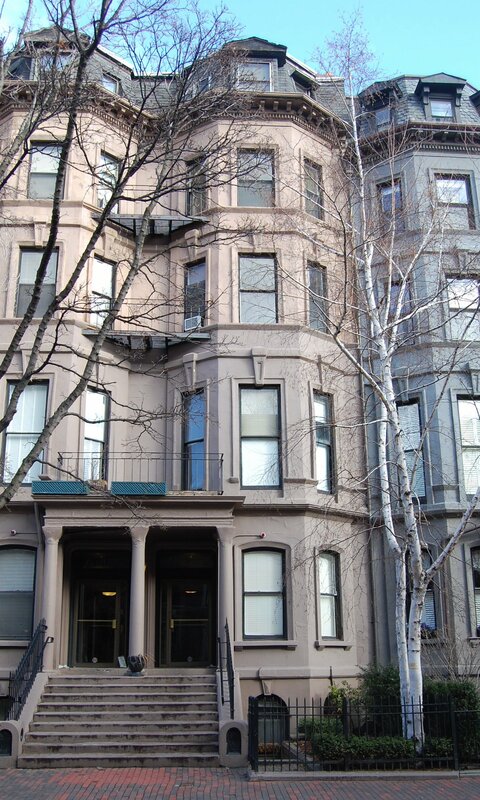 Charles McGlue continued to live at 9 Marlborough until about 1963, when he moved to an apartment at 244 Beacon. On September 23, 1963, 9 Marlborough was purchased from Charles McGlue by real estate broker and investor Charles Talanian and his wife, Nevart (Semonian) Talanian. They acquired 11 Marlborough at the same time. In January of 1964, Charles Talanian filed for (and subsequently received) permission to convert each house into eleven apartments.